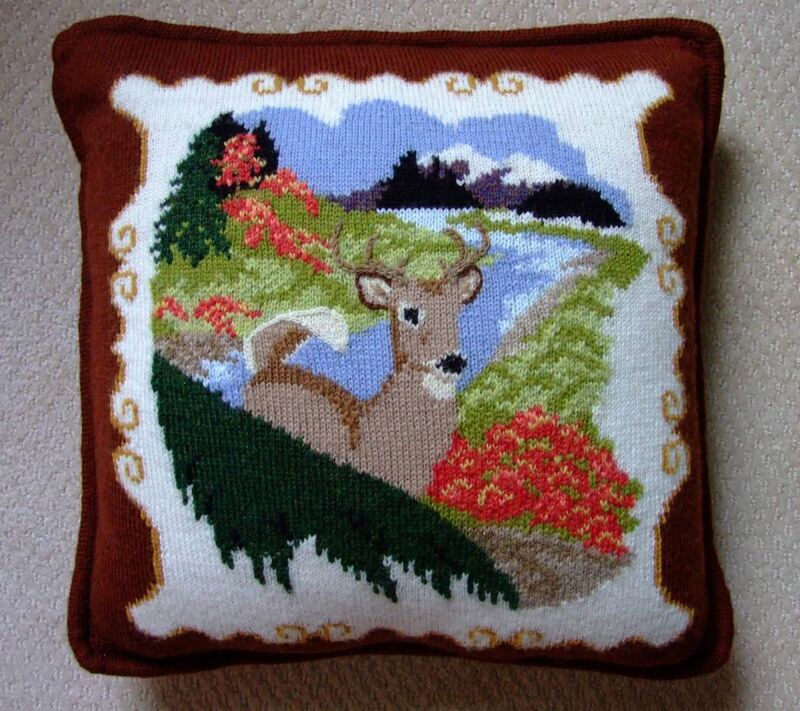 I just finished another Whitetail Buck pillow. This one has a knitted cording incorporated into the pillow top, along with the seam allowance to help in sewing it to a cloth back. I even made my own cording. It was fun! 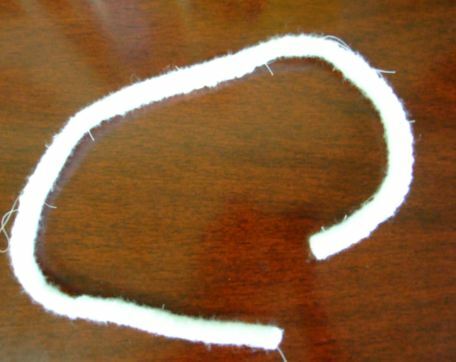 The picture below is a “snip-it” of a section of the cord that frames the pillow. Here you see it in contrast with the cloth back. I have to say that there is no comparison to the commercial cording available. I have tried finding complimentary edging for this use, but have always been disappointed. The fillers they use are mostly cotton, and seem lumpy at best, not to mention that they take a much longer time to dry. That is why I decided on this approach-make your own. In addition, there is no better match in color than the actual yarn you are using in your project. I will be adding this pattern to the Pattern Catalog page, so feel free to upload it. The pattern contains 18 pages of detailed charts and instructions. You can use Intarsia, Armenian Knitting, and sections of Fair Isle in this project. 1. Knit the Basic chart. 6. Close tubing, and make button hole opening for cording. 8. (opt) Secure pillow top to woven fabric. 9. Prepare fabric back, and sew to pillow top, make cording. 10. Insert cording. Stitch pillow close. Adjust cording. Close cording opening. 10. Decide on some of the options I have for making the pillow cover removable for washing. The pattern walks you through all the above issues. Wow!! And that ALL??? I’m tired just making the list. But trust me, it was worth it. My friend Deb at Tempting Tangles ( see link on side bar) has given it her approval. You will also be given instructions on making your own cording out of poly quilt batting, which, of course, makes it lighter, and easier to dry when washed. 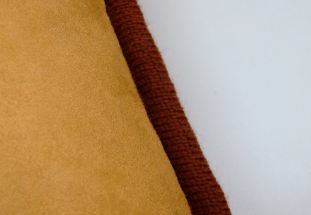 This particular pattern is backed with fabric that has been pre-washed, so the entire pillow can be “dunked” in Wool wash, squeezed out, then air dried without much fuss. My hope that you will try your hand at color knitting. I also hope you will take a look at my “Painting with Yarn” E-book when it comes off the press. The book contains all my color knitting experience on this project, along with detailed illustrations and how to’s, or what I call, “Technical Tutoring.” I hope to have it available for you soon. Would you believe it, I am already up to 60 pages! As a side note, I will be uploading a couple of new tutorials on my “Multi-color Knitting Tips” page. Check them out.